Porcelain (/ˈpɔːrsəlɪn/) is a ceramic material made by heating materials, generally including kaolin, in a kiln to temperatures between 1,200 and 1,400 °C (2,200 and 2,600 °F). The toughness, strength, and translucence of porcelain, relative to other types of pottery, arises mainly from vitrification and the formation of the mineral mullite within the body at these high temperatures. Though definitions vary, porcelain can be divided into three main categories: hard-paste, soft-paste and bone china. The category that an object belongs to depends on the composition of the paste used to make the body of the porcelain object and the firing conditions. Porcelain has been described as being "completely vitrified, hard, impermeable (even before glazing), white or artificially coloured, translucent (except when of considerable thickness), and resonant". However, the term "porcelain" lacks a universal definition and has "been applied in an unsystematic fashion to substances of diverse kinds which have only certain surface-qualities in common". Traditionally, East Asia only classifies pottery into low-fired wares (earthenware) and high-fired wares (often translated as porcelain), without the European concept of stoneware, which is high-fired but not generally white or translucent. 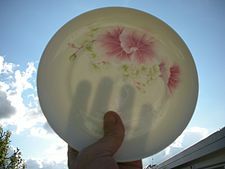 Terms such as "proto-porcelain", "porcellaneous" or "near-porcelain" may be used in cases where the ceramic body approaches whiteness and translucency. The clays used are often described as being long or short, depending on their plasticity. Long clays are cohesive (sticky) and have high plasticity; short clays are less cohesive and have lower plasticity. In soil mechanics, plasticity is determined by measuring the increase in content of water required to change a clay from a solid state bordering on the plastic, to a plastic state bordering on the liquid, though the term is also used less formally to describe the ease with which a clay may be worked. Clays used for porcelain are generally of lower plasticity and are shorter than many other pottery clays. They wet very quickly, meaning that small changes in the content of water can produce large changes in workability. Thus, the range of water content within which these clays can be worked is very narrow and consequently must be carefully controlled. Unlike their lower-fired counterparts, porcelain wares do not need glazing to render them impermeable to liquids and for the most part are glazed for decorative purposes and to make them resistant to dirt and staining. Many types of glaze, such as the iron-containing glaze used on the celadon wares of Longquan, were designed specifically for their striking effects on porcelain. Biscuit porcelain is unglazed. 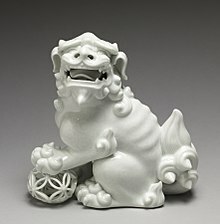 Porcelain originated in China, and it took a long time to reach the modern material. Until recent times, almost all East Asian porcelain was of the hard-paste type. There is no precise date to separate the production of proto-porcelain from that of porcelain. 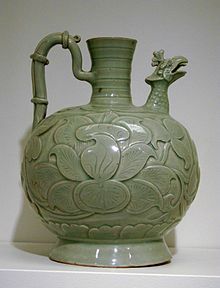 Although proto-porcelain wares exist dating from the Shang dynasty (1600–1046 BC), by the time of the Eastern Han dynasty period (206 BC–220 AD), glazed ceramic wares had developed into porcelain, which Chinese defined as high-fired ware. By the late Sui dynasty (581–618 AD) and early Tang dynasty (618–907 AD) the additional Western requirements of whiteness and translucency had been achieved, in types such as Ding ware. The wares were already exported to the Islamic world, where they were highly prized. Bowl with dragons, phoenixes, gourds, and characters for happiness. From the Peabody Essex Museum. Eventually, porcelain and the expertise required to create it began to spread into other areas of East Asia. During the Song dynasty (960–1279 AD), artistry and production had reached new heights. The manufacture of porcelain became highly organised, and the kiln sites excavated from this period could fire as many as 25,000 wares. While Xing ware is regarded as among the greatest of the Tang dynasty porcelain, Ding ware became the premier porcelain of the Song dynasty. Exports to Europe began around 1660, through the Chinese and the Dutch East India Company, the only Europeans allowed a trading presence. Chinese exports had been seriously disrupted by civil wars as the Ming dynasty fell apart, and the Japanese exports increased rapidly to fill the gap. At first the wares used European shapes and mostly Chinese decoration, as the Chinese had done, but gradually original Japanese styles developed. Nabeshima ware was produced in kilns owned by the families of feudal lords, and were decorated in the Japanese tradition, much of it related to textile design. This was not initially exported, but used for gifts to other aristocratic families. 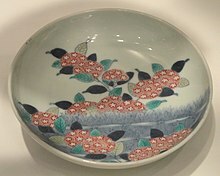 Imari ware and Kakiemon are broad terms for styles of export porcelain with overglaze "enamelled" decoration begun in the early period, both with many sub-types. 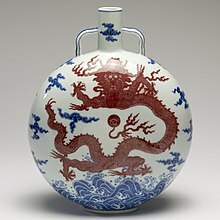 The Fonthill vase is the earliest Chinese porcelain object to have reached Europe. It was a Chinese gift for Louis the Great of Hungary in 1338. 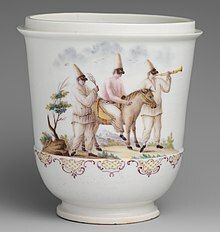 Capodimonte porcelain jar with three figures of Pulcinella from the commedia dell'arte, soft-paste, 1745-50. Soft-paste porcelains date back from the early attempts by European potters to replicate Chinese porcelain by using mixtures of clay and frit. Soapstone and lime were known to have been included in these compositions. These wares were not yet actual porcelain wares as they were not hard nor vitrified by firing kaolin clay at high temperatures. As these early formulations suffered from high pyroplastic deformation, or slumping in the kiln at high temperatures, they were uneconomic to produce and of low quality. Formulations were later developed based on kaolin with quartz, feldspars, nepheline syenite or other feldspathic rocks. These were technically superior, and continue to be produced. Soft-paste porcelains are fired at lower temperatures than hard-paste porcelain, therefore these wares are generally less hard than hard-paste porcelains. Although originally developed in England in 1748 in order to compete with imported porcelain, bone china is now made worldwide. The English had read the letters of Jesuit missionary Francois Xavier d'Entrecolles, which described Chinese porcelain manufacturing secrets in detail. One writer has speculated that a misunderstanding of the text could possibly have been responsible for the first attempts to use bone-ash as an ingredient of English porcelain, although this is not supported by researchers and historians. Traditionally, English bone china was made from two parts of bone ash, one part of kaolin and one part china stone, although this has largely been replaced by feldspars from non-UK sources. Porcelain can be used as a building material, usually in the form of tiles or large rectangular panels. Modern porcelain tiles are generally produced by a number of recognised international standards and definitions. Manufacturers are found across the world with Italy being the global leader, producing over 380 million square metres in 2006. Historic examples of rooms decorated entirely in porcelain tiles can be found in several European palaces including ones at Galleria Sabauda in Turin, Museo di Doccia in Sesto Fiorentino, Museo di Capodimonte in Naples, the Royal Palace of Madrid and the nearby Royal Palace of Aranjuez. and the Porcelain Tower of Nanjing. Porcelain Chamber Pots from Vienna. ^ "Porcelain, n. and adj". Oxford English Dictionary. Retrieved 18 Jun 2018. ^ Kelun, Chen (2004). Chinese porcelain: Art, elegance, and appreciation. San Francisco: Long River Press. p. 3. ISBN 978-1-59265-012-5. Archived from the original on 2013-05-28. ^ a b "Porcelain". Columbia Encyclopedia Sixth Edition. 2008. Archived from the original on 2009-03-02. Retrieved 2008-06-27. ^ a b Te-k'un, Cheng (1984). Studies in Chinese ceramics. Hong Kong: Chinese University Press. pp. 92–93. ISBN 978-962-201-308-7. Archived from the original on 2017-12-02. ^ Wood, Nigel (2011). Chinese Glazes: Their Origins, Chemistry, and Recreation. London: A. & C. Black. ISBN 978-1-4081-4025-3. ^ Cohen, David Harris; Hess, Catherine (1993). Looking at European ceramics : a guide to technical terms. Malibu: The J. Paul Getty Museum Journal. p. 59. ISBN 978-0-89236-216-5. Archived from the original on 2014-07-06. ^ a b Burns, William E. (2003). Science in the enlightenment: An encyclopedia. Santa Barbara: ABC-Clio. pp. 38–39. ISBN 978-1-57607-886-0. Archived from the original on 2015-11-20. ^ a b c Richards, Sarah (1999). Eighteenth-century ceramic: Products for a civilised society. Manchester: Manchester University Press. pp. 23–26. ISBN 978-0-7190-4465-6. Archived from the original on 2013-05-28. ^ Wardropper, Ian (1992). News from a radiant future: Soviet porcelain from the collection of Craig H. and Kay A. Tuber. Chicago: Art Institute of Chicago. ISBN 978-0-86559-106-6. Archived from the original on 2017-12-02. ^ Gleeson, Janet. The Arcanum, an accurate historic novel on the greed, obsession, murder and betrayal that led to the creation of Meissen porcelain. Bantam Books, London, 1998. ^ ‘The Sites Of The Chelsea Porcelain Factory.’ E.Adams. Ceramics (1), 55, 1986. ^ "Bow". Museum of London. Archived from the original on 3 December 2011. Retrieved 31 October 2011. ^ "Bow porcelain bowl, painted by Thomas Craft". British Museum. Archived from the original on 4 February 2012. Retrieved 31 October 2011. ^ a b "Bow porcelain". British History Online. University of London & History of Parliament Trust. Archived from the original on 3 December 2011. Retrieved 31 October 2011. ^ "St James's (Charles Gouyn)". Museum of London. Archived from the original on 3 December 2011. Retrieved 31 October 2011. ^ Ceramic Figureheads. Pt. 3. William Littler And The Origins Of Porcelain In Staffordshire. Cookson Mon. Bull. Ceram. Ind. (550), 1986. ^ "History". Royal Crown Derby. Archived from the original on 4 June 2011. Retrieved 1 November 2011. ^ 'The Lowestoft Porcelain Factory, and the Chinese Porcelain Made for the European Market during the Eighteenth Century.' L. Solon. The Burlington Magazine. No. 6. Vol.II. August 1906. ^ Reed, Cleota; Skoczen; Stan (1997). Syracuse China. Syracuse, N.Y.: Syracuse University Press. pp. 51–52. ISBN 978-0-8156-0474-7. Archived from the original on 2014-01-07. ^ N. Hudson Moore (1903). The Old China Book. p. 7. ISBN 978-1-4344-7727-9. Archived from the original on 2013-05-28. ^ Strumpf, Faye (2000). Limoges boxes: A complete guide. Iola, WI: Krause Publications. p. 125. ISBN 978-0-87341-837-9. Archived from the original on 2017-12-02. ^ a b Burton, William. 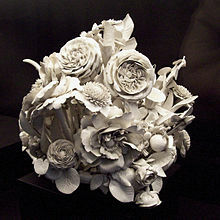 Porcelain, Its Nature, Art and Manufacture. London. pp. 18–19. ^ Changes & Developments Of Non-plastic Raw Materials. Sugden A. International Ceramics Issue 2 2001. ^ “New American Standard Defines Polished Porcelain By The Porcelain Tile Certification Agency.” Tile Today No.56, 2007. ^ Porcelain tile as defined in ASTM C242 – 01(2007) Standard Terminology of Ceramic Whitewares and Related Products published by ASTM International. ^ ”Italian Porcelain Tile Production At The Top” Ind.Ceram. 27, No.2, 2007. ^ a b “Porcelain Tile: The Revolution Is Only Beginning.” Tile Decorative Surf. 42, No.11, 1992. ^ "What is a Bourdaloue?". wisegeek.com. 2014. Archived from the original on 13 December 2014. Retrieved 27 March 2014. ^ "Buick made bathtubs before he built cars | Las Vegas Review-Journal". reviewjournal.com. 2014. Archived from the original on 4 October 2014. Retrieved 27 March 2014. 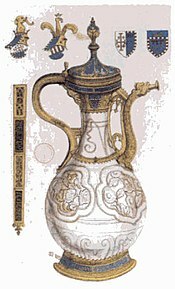 ^ "Polskie Fabryki Porcelany "Ćmielów" i "Chodzież" S.A." Polskie Fabryki Porcelany Ćmielów i Chodziez S.A. Archived from the original on 19 November 2016. Retrieved 31 January 2017. ^ "Kristoff Porcelain". Kristoff Porcelain. Archived from the original on 24 July 2016. Retrieved 26 July 2016. ^ "Lubiana S.A. - polski producent porcelany dla domu i rynku horeca". Lubiana S.A. - polski producent porcelany dla domu i rynku horeca. Archived from the original on 10 December 2016. Retrieved 31 January 2017. ^ "Maghsoud Factories Group". Maghsoud Factories Group. Archived from the original on 13 July 2016. Retrieved 26 July 2016. ^ "History". Zarin Iran Porcelain Industries. Zarin Iran Porcelain Industries. Archived from the original on 5 February 2017. Retrieved 5 February 2017. Guy, John (1986). Guy, John (ed.). Oriental trade ceramics in South-East Asia, ninth to sixteenth centuries: with a catalogue of Chinese, Vietnamese and Thai wares in Australian collections (illustrated, revised ed.). Oxford University Press. Retrieved 24 April 2014.